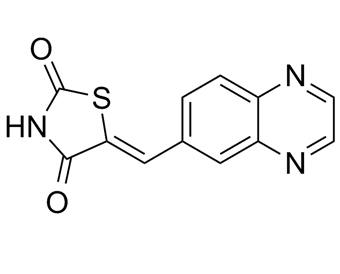 AS605240 is a selective PI3Kgamma inhibitor, has been proved effective on several inflammatory diseases. Orally administration of AS605240 significantly prevented lung inflammation and reduced collagen deposition. AS605240 also inhibited augmented expression of TNF-alpha and IL-1beta induced by bleomycin instillation. AS605240 may be a useful in treating inflammation diseases. AS605240 may represent a promising novel agent for the future therapy of pulmonary fibrosis.
. Huang X, et al. Endothelial p110γPI3K Mediates Endothelial Regeneration and Vascular Repair After Inflammatory Vascular Injury. Circulation. 2016 Mar 15;133(11):1093-103.
. Camps M, et al. Blockade of PI3Kgamma suppresses joint inflammation and damage in mouse models of rheumatoid arthritis. Nat Med. 2005 Sep;11(9):936-43.